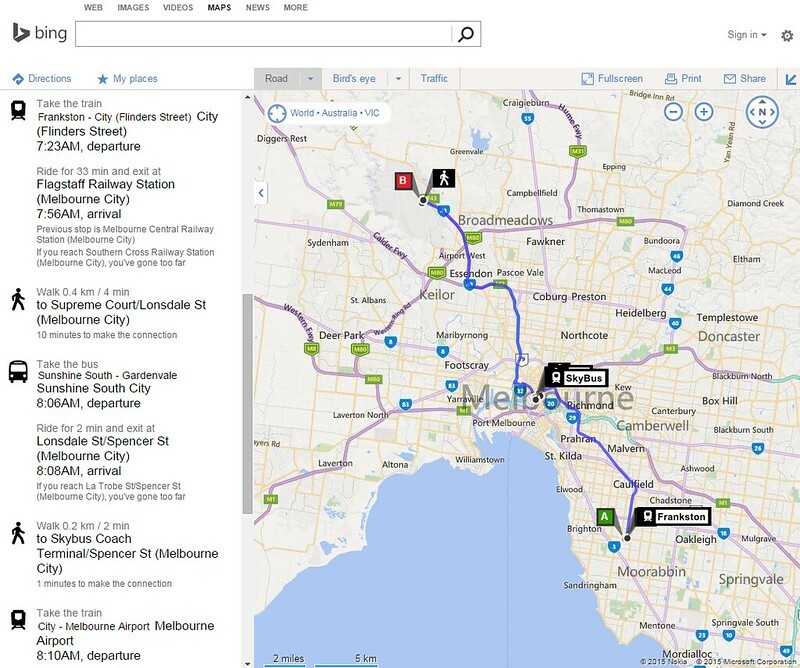 Yesterday it was discovered (by Rod S) that Bing Maps has loaded the Melbourne/Victoria GTFS public transport timetable data, and thus you can now plan PT trips on Bing. Who uses Bing? Almost nobody I suspect — it was found by mistake! It looks pretty good. Most trips I’ve tried provide a good, solid, logical result. There are some quirks, and I’ve shown one in the example above: in my testing of trips to the airport, I’ve found CBD connections are funny. In one case it suggested I alight a train at Flinders Street, and catch a City Circle tram around the city to Latrobe/Spencer Streets (taking 32 minutes) then walk to the Southern Cross coach terminal. Then it suggested I change onto a V/Line bus to Heathcote and Barham, which does stop at the airport about once a day, but it’s a pick-up only stop, so technically passengers can’t alight there. In the case above, it’s suggested I hop off the train at Flagstaff, walk a block, catch a bus to Southern Cross, then the Skybus (which it thinks is a train — if only!). 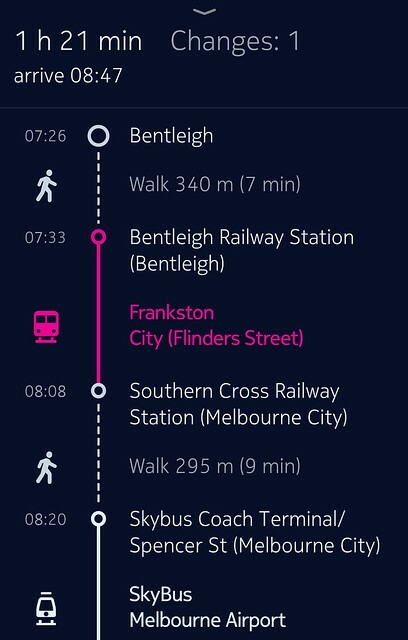 In both cases I suspect it’s minimised the walking involved, but has come up with a counter-intuitive result, the logical path being to catch the train to Southern Cross. The official PTV (then Metlink) planner had these kinds of issues in the early days. However the V/Line bus problem might be a data issue, or an issue with interpretation of the data (as I’m told GTFS feeds do include provision for “pick up only” stops). Nonetheless, as I said, for most trips it’s providing good results. The same goes for Nokia Here — which also has the GTFS data loaded, and in brief testing, showed a more logical route to the airport. Both are available for phones, so it’s possible to plan trips on the run. Various other lesser-known app providers have also loaded the data (for instance: Offi). In my minimal testing, it appears Nokia Here uses a little less battery power on Android, and also doesn’t distract with all the other Bing search stuff I don’t need… though Nokia also has a lot of driving support that I can’t immediately see myself using. I doubt many people will switch over to Bing or Here, but it’ll be interesting to see how long it takes Google to get its act together. It’s good to see progress in this area — the release of the GTFS data has made it possible for PT trip planning to be more readily available to more people — without enduring PTV’s clunky apps and web site. I will have to say that Offi has had data for quite some time, probably using the JSON. The Nokia maps also had navigation directions before GTFS was released as well. – SkyBus is listed as route_type “0”, which is supposed to be for trams/light rail. – The Melbourne Airport coach stop is correctly listed with pickup_type and drop_off_type of “1” in the appropriate trips to/from Melbourne. So the first is a problem with PTV’s GTFS data, the latter more likely a problem with Bing Maps. Here Maps were probably the first to get the data together; if I’m not mistaken, took them less than a week. As a Windows Phone user, we’re not blessed with Google Maps, but have got Here Maps which is an excellent solution. Have used it over the past few weeks and generally been very good. I used to use Offi quite a bit and I found it quite good, but I can’t wait for Google Maps to have the public transport information. Nearly all transport apps have their good and bad points, but knowing how so many different ones work is tiresome. I will stick with Google and know it properly, assuming it works as well as it does elsewhere. It has already told me a few bus routes where I would have assumed a tram to be quicker. Should be great for the bus’s poor reputation in Melbourne. If it had real time data it would be amazing for buses. The problem with the bus option is that without realtime you don’t have the assurance it actually WILL be faster. Consequently, you end up on the tram because at least you know there’ll be one coming based on real information. Agree with lomlate. Buses should be more user friendly thanks to GTFS. Really, the DOT need to take this chance to make buses something more than a mode of last resort for Melbournians. Should also add real time tracking like the trams have. Of course, fixing up bus routes and their frequencies also needs to happen too. Shortly before the 2010 election, I attended a function at Flemington Racecourse (without any trains operating). Plotting the return trip on the old Metlink journey planner, from there to Vermont South had no surprises, if I left before 00:30-ish (12:30am – starting with the inbound 57 tram). After that time, it suggested taking the outbound 57 tram (due no further inbound trams), then the 82 tram, then the nightrider to Craigieburn (bizarre), then the nightrider to Flinders St, then the nighrider to Knox. Obviously the options are difficult very late at night, but the trip to Craigieburn and return is downright bizarre. And the (now PTV) trip planner still does it today, if you depart at 01:31 Sunday, and the one before it is a bit suspect as well (depart 00:49 via 57, 82, Footscray, St Albans, city, Knox nightrider). @Evan, thanks for checking the source data! Sounds like PTV and Bing both need to fix their bits. @Kiwi Nick, it might be related to the Craigieburn Nightrider operating the outer section of the route as a big loop – eg it’s a different route outbound to inbound. Presumably the 82 tram connects outbound, but not inbound.